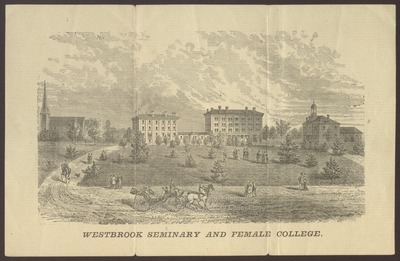 "Westbrook Seminary and Female College, Engraving, ca.1870"
A new campus engraving, ordered in 1870, showed the following Westbrook Seminary buildings: the First Universalist, later All Souls, Church of Westbrook (1868); Goddard Hall (1858); Hersey Hall (1869); and the Seminary Building (1834). A single-story dining room connected Goddard and Hersey, utilizing the kitchen under Goddard. Hersey Hall was fitted with steam heat and bathing rooms. Goddard Hall retained its two doors and dividing wall. The small Universalist meeting house is shown attached to the rear of the classroom building to serve as assembly hall and chapel.